My dog seems sad – is it depression? We’re used to our dogs being a source of happiness, so it can be heartbreaking to see them appearing sad – especially if this lasts for a long time. Could your dog be depressed? There’s no definitive answer to whether dogs suffer from depression the same way we do. That can make it a tricky problem to tackle. The best approach is to rule out other factors that could explain the signs of depression in your dog, and go from there. Try adjusting your dog’s routine to see if some extra mental stimulation helps get them back to their old self – anything from taking a different route on your morning walk to introducing interactive games and puzzle feeders can make a big difference. Related blog: Is my dog bored? Seasonal affective disorder (SAD) is well documented in humans. And a study by the PDSA showed our dogs might suffer from it too. Shorter days and darker walks can leave your dog producing higher levels of melatonin, a hormone that can make them feel sleepy and lethargic. Getting less natural light also reduces the amount of serotonin your dog produces. The result? Changes in appetite, mood, and sleep patterns – a lot like depression. If your pup is on the cusp of adulthood, they may suddenly seem a bit lethargic after the everything-is-awesome excitability of their early months. This can look a bit like depression at first, but don’t worry; it’s a normal part of the transition into adulthood. A bit of moodiness and disobedience is also to be expected – think of it as the dog equivalent of a stroppy teenage phase. It generally won’t last longer than a year. A new addition to the family or a change to the household routine can be enough to knock your dog off their game. Think back to when you noticed the change in your dog’s behaviour, and you’ll likely uncover the cause – then you can tackle it directly. Our dogs want to please us, so they’ll often try to hide it when they’re in pain. If your dog’s suddenly irritable or less keen to move around, it could be a sign of physical, rather than mental distress. A check-up at the vet is the best way to find out for sure. Life gets more difficult for your dog as they get older. Joints get sore, energy levels dip, and even food becomes less exciting than it once was. Combined, these things can look a lot like depression. But there are lots of ways you can help ease your dog’s transition into old age. Gentler exercise, and food tailored for their senior years to name just two. A tails.com feeding plan adjusts with your dog throughout their life, to help your dog cruise into their later years. Older dogs can also suffer from Canine Cognitive Dysfunction (CCD) – a condition with symptoms that overlap those of depression. CDD is a bit like dementia and can leave your dog confused and withdrawn. They may start bumping into things or barking at inanimate objects. If your dog’s behaviour change includes signs of disorientation, it’s a good idea to get your vet’s input on what’s going on. When a family member or another pet dies, it can seem like our dog feels the loss with us. Perhaps they do. Understanding our dogs’ emotions is tricky, so it’s hard to know for sure – especially as our grief can influence how we interpret our dog’s behaviour. An alternative theory is that dogs don’t process loss quite like we do, but respond to the immediate, unsettling change in their environment or social structure. Or that our dogs pick up cues from us, so it’s our grief that’s making them seem sad. Whatever the explanation, if your dog is showing signs of depression after a family loss, we recommend giving them some time, and lots of love, and seeing if things improve. 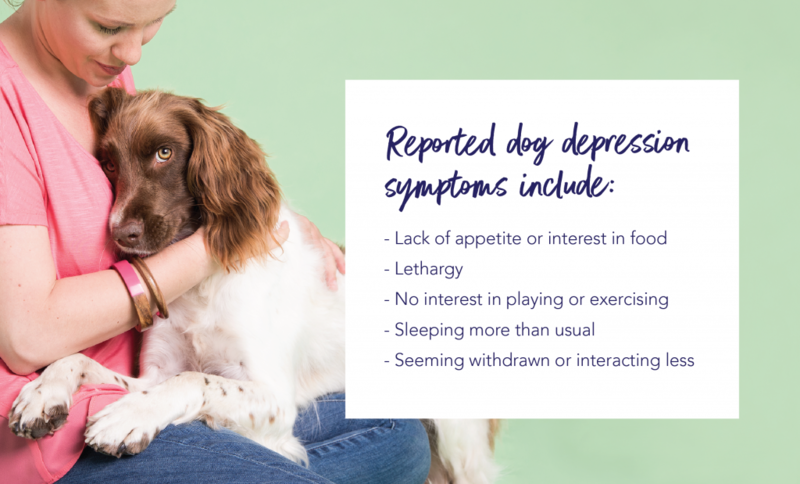 How can I help my dog’s depression symptoms? Interpreting dog behaviour is complicated – but can be easier with an objective eye. Dog behaviourists are experts in decoding your dog’s signals, so can help you narrow down what’s wrong. If you’re still concerned about your dog’s wellbeing, speak to your vet. They can help you pinpoint any underlying issues that could be causing your dog’s out of character behaviour. In severe cases, they might suggest medication to help. Got a question about dogs and depression? Get in touch with us at hello@tails.com – our vet and nutritionist team have all the information you need to put your mind at rest. Our dog loves walking (as most dogs do), he gets so excited and cries whilst jumping around like a kangaroo. But since the dark nights, he goes out and if it’s raining; sits on the door mat refusing to move 😢. I do think the winter weather does affect the dogs moods, my dog is really small and he gets cold easy; he also hates wearing his coat 😂😂 . When we lost our beloved black Labrador Bertie, our equally loved Golden Retriever Goldie, was absolutely grieving. She became very quiet and as she was almost totally blind, and he was her eyes, she lost a lot of confidence. When we got a new rescue dog, Max, she was so excited, and happy, it was so lovely to see. l have a rescue dog from Romania who is afraid of the dark. if going for a walk she stays so close that she almost trips you. She will not go into the garden once it gets dark even if you go out to encourage her. Please help she is a lovely dog and has no other problems so can only assume something must hve happened in the past. We have had her for a year she is approximately 3 years old. My dog and my friend’s dog were very close “an item”. When my friend’s dog became ill, I would visit everyday and he would go straight to her, give her a sniff and then lay down, she would get out of her bed and lay beside him. However in the last few days he would not go in the same room. We assume he knew the end was coming. Once she had passed away he was noticeably very sad, spending many hours on my lap, just seeking comfort. I also found that I could not take him to the park where they had first met. He always wanted to go back to the car park as if waiting her arrival. I would certainly say he was sad and depressed at the loss of his friend.